The Philadelphia Phillies organization announced on Thursday afternoon that club president David Montgomery, serving in that post since 1997, is stepping down temporarily due to medical reasons. The 68-year old who also serves as the Phillies CEO is a part-owner and general partner, and recently underwent surgery in relation to cancer of the jaw. It was further announced that Baseball Hall of Famer and former club GM Pat Gillick will serve in Montgomery’s post during his recuperation period. It is hoped that Montgomery will be able to return actively to the team presidency once he is fully recovered. Montgomery grew up in Philly, attending numerous games at Connie Mack Stadium during the 1950′s and 60′s. He graduated from Penn Charter high school and then from the University of Pennsylvania. He continued with his Penn education at the Wharton Business School, graduating in 1970, the Phils final season at Connie Mack. In 1971, Montgomery was hired as a member of the Phillies sales department with some intervention from organizational legend Robin Roberts. He spent some time as the scoreboard operator at Veteran’s Stadium, and then quickly rose through the organization, becoming the head of sales and marketing, and by the end of the 70′s had become the head of the business department. In 1981, Montgomery became part of the team put together by Bill Giles to purchase the Phillies from Ruly Carpenter. With Giles as the principle owner, Montgomery became the executive vice-president. He would serve in this post, helping run the team and make numerous important decisions, for the next 16 seasons. In 1997, Montgomery ascended to the club presidency when Giles took on the position of Chairman and began the fight for a new ballpark. This made Montgomery the first Philadelphian to head the organization in six decades. He has been active in numerous Philadelphia civic ventures, for his University of Pennsylvania alma mater, and has served Major League Baseball in a number of roles. The Oakland A's were on top of the first Power Rankings back in June, slipped just a notch to 2nd in July behind Kansas City, and were tied at the top with the Angels on August 1st. Here in the middle of August, they move back on top of the rankings all by themselves. In addition to being on top of these rankings, they are also baseball's top team by record. Their win-loss mark of 73-48 comes out to a .603 win percentage, the best in baseball, and they hold a 2-game lead in the A.L. West. Meanwhile, three other teams: Baltimore, Washington, and the LA Dodgers, have all taken charge in their respective divisional races and will be tough to catch. But the other 3 divisional races remain up for grabs. The NL Wildcard race has 4 teams within 4 games, and the AL Wildcard has 3 teams within 4 games. The A's have been consistently at or near the top of the Power Rankings since the summer began. GM Billy Beane has assembled an excellent all-around team that can beat you in many ways, and manager Bob Melvin and his staff keep them focused and enthused. The A's are baseball's #2 offensive team overall, have the 5th-rated defense, and rank 10th in pitching. Those numbers are full season numbers. With the pre-trade deadline pickups of ace-caliber starting pitchers Jon Lester and Jeff Samardzija, they made themselves clear favorites for a deep post-season run. When I ranked the Royals at the top back on July 1st, there were many who scoffed. After all, KC has not been to the playoffs since their lone World Series victory way back in 1985, nearly three decades ago. But most everyone around the game has recognized the young talent they were accumulating over the last few years. It is all finally coming together. This past week, they took over the A.L. Central lead from recent perennial winners Detroit. They are for real, featuring what is by far the #1 defense in the entire game. The Royals also have the 6th-rated pitching staff. Their offense is just 11th, and they could use an impact bat, which might have to come from someone already on the roster stepping forward down the stretch. The Halos are obviously one of baseball's best teams. Unfortunately for them, they play in the same division as the very best team in the game. The Angels have battled Oakland most of the year, and just two weeks ago the two teams were tied at the top of the Power Rankings. Since then, the A's have opened a 2-game cushion on their division rivals. The Angels remain comfortably in charge of a playoff berth, holding the A.L. 's top Wildcard spot by 5 full games. They own the game's #1 offense, and have baseball's 6th-ranked defensive unit. It's their 12th ranked pitching staff that is holding them back a bit. As I mentioned previously, they could use another proven, veteran starting pitcher. In any event, they look like a post-season shoo-in at this point, and we might finally see the game's most exciting young player, their 23-year old superstar Mike Trout, take home the MVP Award. This may be a case of a team cashing in a major trade chip, pitcher David Price, just a bit too soon. The Rays were awful at the start of the season, falling below the .500 mark on April 23rd and bottoming out at 31-48 by June 24th, at which point they were a season-high 13 games out in the division and the "for sale" signs were clearly up. Funny thing happened after that, they began to win, and win regularly. They have now won 6 of their last 8, with the only two losses coming via opponents walk-offs. They are just a game under .500 after going 29-12 over the last month and a half, and are just 6 out in the Wildcard race. In short, had they kept Price, they might have a shot. They are the only team in MLB besides the A's to rank in the Top 10 on Offense (5), Pitching (7), and Defense (10) and cannot be counted out. The Nats have taken charge in the N.L. East over the last couple of months. Rising from below .500 and not even being spoken of in the first Power Rankings on June 1st, Washington now owns a 7-game lead in the loss column on 2nd place Atlanta. They are the N.L. 's hottest team, and it's best all-around club. The Nats rank 9th in baseball on offense, and those numbers have been rising. They are just 14th in defense, held back there by injuries during the first half to Jayson Werth and Bryce Harper, and here in the 2nd half to Ryan Zimmerman. But they possess the game's 1st overall pitching staff. Pitching wins in the post-season, and their enviable starting rotation depth should keep them as N.L. favorites right on into the post-season. Bonus Commentary: Buck Showalter is a miracle worker. With the loss of catcher and team leader Matt Wieters in the first half, and now of Manny Machado for at least a couple of weeks, that will have to continue. But the O's are starting to open up a big lead in the A.L. East, now up to 7 1/2 games. Bonus Commentary: Some find it amusing that in what has been an awful follow-up to last year's World Series win, the Bosox have consistently been a Top 10 team in the Power Rankings. The numbers don't lie, folks. This team is better than their record. Don't be surprised if they quickly turn it around in 2015. Some of these races are clearing up. The A's may pull away with their starting pitching acquisitions, previously their only weakness. The Beltway pair of the Orioles and Nats are already pulling away in the respective league's East division races. Everything is too early to call, but right now, I see the Washington Nationals as the best bets to actually win their division in the National League, and with Oakland as at least a clear playoff team in the American League. Hopefully in two weeks, on Labor Day, I may be able to call something formally. For my fellow fans of the Fightin' Phils, things in our neck of the woods are even worse statistically than they have looked on the field and in the standings, if that is possible. The Phillies are the worst team in the National League, the 2nd worst ahead of only Houston in all of baseball. And the Astros have far and away a better farm system. Out of 30 teams in MLB, the Phils are 24th in Pitching, 25th in Defense, and 28th in Offense. They have no strengths, they are old and/or under-achieving, and they don't have a lot of impact-level talent coming from the Minors. This will not be an easy fix, especially with the current General Manager steering the ship. As the play on the field has deteriorated over the last few seasons, the performance coming from the Philadelphia Phillies TV broadcast booth also deteriorated. Long gone were the glorious days when fans were able to enjoy the sounds of Harry Kalas and Richie Ashburn during the majority of the Phils’ TV and radio broadcast innings. Tom McCarthy, Chris Wheeler, and Gary Matthews made listening to TV less than enjoyable for many. TOM MCCARTHY: ‘C’ – McCarthy only even gets this high of a grade for one reason, and that is his obvious love of the team. I don’t want my broadcasters being a downer, and I can’t stand the negativity that often comes from local sports talk radio. But McCarthy is way too far on the other end of the spectrum. He is not just a “glass half full” kind of guy, he is a Pollyanna. His jokes are not funny, and he tries to put a positive spin on almost everything, often when criticism of a player or the team is what is warranted. He seems like a really nice guy, and my gut tells me there is no way that decision makers will make a change. But as the lead man on TV broadcasts, he is a problem the longer he is kept. The Phillies would do well to find a better day-to-day baseball voice. MATT STAIRS: ‘D’ – I will always have a warm and fuzzy place for Stairs in my fan’s heart for two reasons. First and most obvious is the homerun. You know which one. The 2-run moonshot crushed deep into the California night off Jonathan Broxton that gave the Fightins a 2-run lead in the 8th inning of Game #4 of the 2008 NLCS vs. the Dodgers. You may not remember the second though. I was driving home from the Jersey shore in early April of 2009 when Stairs crushed a homer at the end of a road game in Colorado. It would be the final homerun call in the career and life of Harry Kalas, who would pass away the following day. Stairs does not come across as personable on the air, and though he has the anecdotal stories required of an ex-player in the booth, he does not have the story-telling ability to relate them well enough. At this point, he looks like a mistake hire for the job, ala Gary Matthews, and we had to put up with Sarge for years. JAMIE MOYER: ‘C’ – I preface this by saying that I love Jamie Moyer. He is a Philly guy, born and raised. He graduated from my Saint Joe’s alma mater. He helped pitch the team to a World Series victory. 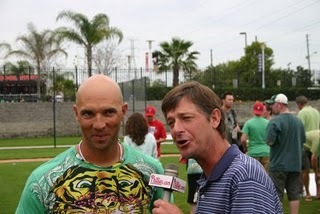 He was the last player my age to play for the Phillies. He does tremendous charity work, loves the organization, and is a likeable guy in so many ways. But on the air he seems to be forcing it. I think that over time, and with the right professional broadcasting partner in the booth, Moyer could be a longterm gem. For now, he gets the midling ‘C’ grade. But I believe there is more here. Because of who he is overall, I am much more willing to give him the chance to prove that than I am with Stairs. MIKE SCHMIDT: ‘A’ – The greatest position player in the history of the franchise was brought in this season to provide a player’s perspective for Sunday home games. For the most part, Schmitty has been excellent. He has great stories to tell from glory days of my youth. He is a fantastic conversationalist. He does a nice job of analyzing what a player or pitcher may be trying to do at a certain point in a game. At times he takes over the broadcast too much. My guess is that’s a natural outcome of the limited home-game Sunday opportunities he gets. If he were a regular, working every game, my bet is that he would be not just good, but great. I doubt the Phillies could get him to give up his life in Florida to do the traveling it would take to be a regular broadcaster. Shame. RICKY BOTTALICO: ‘B+’ – Ricky Bo is not the greatest studio analyst and commentator in the history of pre and post-game shows. Not by a long shot. He can be too animated at times, and at times he just comes off as a buffoon. But I still like him. Why? Because Ricky Bo is one of the few associated with broadcasting this team who isn’t reluctant to call a spade a spade. He is not intimidated by bad circumstances, and doesn’t get carried away with good. He gives his opinion, usually strongly. I like that, even if he lacks polish. He needs to stay around in-studio. BEN DAVIS: ‘A’ – Does it get any more handsome and chiseled than this guy? But let’s put aside his movie star good looks. The man was a baseball player, one from our area, born and raised a Phillies fan. And he does a really nice job on-air of expressing his opinion. Another one who is, like Ricky Bo, not afraid to hand out criticism when warranted. he’s sometimes a little stiffer, but he does the job with just a bit more polish than Ricky. Another one who needs to stick around in-studio. JIM JACKSON: ‘B+’ – It’s so hard for me to listen to Jim Jackson and hear a Phillies game coming out of that voice, after hearing him broadcast so many Flyers games on the radio over the years. The guy is an excellent broadcaster, that isn’t the problem. He just doesn’t, for me anyway, have what I am looking for in an everyday baseball voice. As a Flyers broadcaster, I would give him an ‘A’ grade. Nice backup guy and post-game show guy, which is usually his role anyway. He is worlds better than Chris Wheeler or Gary Matthews, so that’s also a plus. SCOTT FRANTZKE: ‘A+’ – The simple fact is that Frantzke is a great baseball radio broadcaster. The further fact is that his personable, natural chemistry with regular radio partner Larry Anderson is as tremendous as it is rare. Whether delivering the play-by-play, where his voice is perfect for the job, or commenting on issues surrounding the team on-field and off, or in bantering with Anderson, he is personable and professional. He also has a tremendous, understated humor. I didn’t think it would be possible to ever again experience a Kalas-Ashburn type enjoyable performance. With Frantzke and LA, it may not be quite at that legendary level – yet – but it is much closer than I ever thought I could hope to enjoy again. The team must keep him on board. LARRY ANDERSON: ‘A’ – His work with Frantzke is the stuff that legends are ultimately made of in a baseball broadcasting team. Together they enjoy an on-air chemistry that is impossible to force. Their timing and humor together is impeccable. LA brings the former player perspective, and continues to display passion of the game and the team. I only gave Frantzke the slightly higher ‘+’ designation because of Scott’s play-by-play abilities. But when Frantzke and LA are together it’s magic. As I already said, they are as close to Kalas-Ashburn as I ever had a right to hope to expect to enjoy again in my lifetime. The powers-that-be need to be sure to commit to this team as long as possible. Wouldn’t it be awesome to get them on TV for at least a few innings each game as well? If Harry and Whitey could do it, why not Scott and LA? The Phillies get other regular contributions from Comcast folks such as Gregg Murphy, Neil Hartman and Leslie Gudel. All three of them do a tremendous job of hosting, interviewing, analyzing, and commenting on the team. I refrain from giving them grades simply because they are neither former players, nor everyday game broadcasters. But all are professional, personable, and do a nice job in whatever role they are asked during any particular broadcast. Overall, the Phillies broadcast team would get a ‘B’ grade, with an ‘A’ for the radio guys and a ‘C’ for the TV broadcasters. Replacing McCarthy with a better everyday baseball play-by-play voice would vastly improve that TV end. Maybe figure out a way to have that new TV guy and Moyer switch off a few innings each game with Frantzke/LA in the radio booth, ala with the old days of Kalas/Ashburn. Those would be my main suggestions for improvement going forward. As the MLB action ended on August 11th, 1994 the defending National League champion Philadelphia Phillies were floundering 7 games below the .500 mark, and already 20.5 games behind the front-running Montreal Expos in the N.L. East Division race. But neither those floundering Fightins or the explosive Expos would win the division that year. No one would win it that year. On August 12th, 1994, exactly 20 years ago today, a work stoppage occurred in the form of a strike action called by the Major League Baseball Players Association in response to ongoing labor problems with the MLB franchise owners. The strike would last the rest of the '94 season, resulting in inconclusive division races and the cancellation of the playoffs and World Series. Many people believe that the entity most injured as a result of the 1994 strike was the Montreal Expos, as well as their fans. The Expos led all of baseball with a 74-40 record at the time, and led the N.L. East by 6 games over the 2nd place Atlanta Braves. Many of these same folks believe that the Expos would have won the World Series that year, and perhaps would still be in Montreal today. Instead, that franchise would see attendance plummet for a decade before moving to become the Washington Nationals. But don't count me among them. The Expos, never having won anything to that point, would have needed to hold their lead over the Braves for another month and a half. I believe that a good case can be made that instead of Montreal in the World Series, we instead would have witnessed what became the 1996 Series, only a couple of years earlier, between the Atlanta Braves and the New York Yankees. They are heroes, icons to a generation of Phillies fans who grew up on the team in the last decade when it moved from the concrete behemoth that was Veteran’s Stadium into the gorgeous ballpark that is Citizens Bank Park. They are the last remnants of the 2008 World Series champion team: Cole Hamels, Carlos Ruiz, Ryan Howard, Chase Utley, Jimmy Rollins, and yes, even Kyle Kendrick. Six years later, those six players are all that remains of a group that inspired so much passion. It seems like it all passed so quickly, and that it should have went on longer. But should it really? What should we have expected, after all? Not only does nothing last forever, but championship sports teams tend to not have a very long shelf life in particular. All we really needed to do was take a look back at the only other World Series winner in this town’s history to know what was likely to happen. It's the 2/3 mark of the MLB regular season, and the 2014 non-waiver trade deadline has just passed. There are clear leaders across all 6 divisions, but none with more than a 5-game lead. In the American League Wildcard race there are 6 teams within 5 1/2 games of the final spot, 4 of them with winning records. In the National League, there are 5 teams within 6 games, 3 of them at .500 or better. Baseball's top individual player in WAR is LA Angels outfielder Mike Trout, the runner-up for the league's MVP Award in each of his first two full seasons. Trout is again a leading contender for the award, and he has driven his Angels into a tie atop the Power Ranking. The PR will now be updated twice a month, and at season's end. So look here again on August 15th, September 1st, September 15th, and again immediately after the close of the MLB regular season. The A's were the top team in the June ranking and #2 in July. For August they are back atop, but this time they are joined by their division-rival Angels in a statistical overall dead heat. I'm listing the Athletics first, because in the actual A.L. West race they lead by 2 games. GM Billy Beane has decided to go all in to win the division, completing trades this past month to bolster the rotation by bringing in righty Jeff Samardzija and lefty Jon Lester. The acquisitions should make the team's 10th-ranked overall Pitching become even more of a separator going forward. The A's are ranked 2nd in Offense, and 9th in Fielding. The Angels are 2 games behind Oakland in the A.L. West, but are in total control of an A.L. Wildcard berth, holding an 8 1/2 game lead in that race. The two division rivals are almost certain to both make the post-season. They will meet 10 more times in the final 53 games, 7 of those this month. It's a 3-gamer in Oakland mid-month, a 4-gamer in Anaheim at end-of-month, then back to Oakland in mid-September. Both teams are talented, but it may be tough for the Halos to keep pace now with the A's rotation pickups. The Angels rank 1st in Offense, 8th in Fielding, and 12th in Pitching. They could really use another veteran starting pitcher or two, if that is possible at this point. The Nats are the PR's fast-risers. They didn't even make the June write-up, because they didn't have a winning record. By July they had risen into the rankings at the #9 spot. Now they're all the way up to #3 overall, and the National League's top team. They hold a 2-game lead on Atlanta in the N.L. East race, but just a game and a half on the Wildcard, so unlike the A.L. top teams, nothing is secure for them. They have the game's #1 ranked Pitching staff, but are rated just 12th in Offense and 13th in Fielding. A huge key has been their return to health, especially getting Jayson Werth and Bryce Harper into the everyday lineup. If Harper can find his stroke and take off, the Nats could run away and hide. Despite being on the outside-looking-in of the A.L. playoff race, the Royals remain among the game's top 5 teams statistically. They are tied with Washington, and are the American League's 3rd overall team. In the A.L. Central race, they trail Detroit by 5 games, and they are just 2 games out of the Wildcard. However, they just lost 1st baseman and team leader Eric Hosmer to injury. He'll be back, but the week's that he will miss could be pivotal. The team is the #1 Fielding team in all of baseball, and is 11th in Pitching. But their 14th rated offense holds them back, and is the weak link that may cause them to miss the MLB playoffs for a 29th straight season, the longest current such streak in the game. The Braves trail Washington by just 2 games in the N.L. East, and are just 1 1/2 games out in the Wildcard race, so they are squarely in the hunt for a post-season berth. But they were the 3rd overall team in baseball for the July rankings, so they did slip a bit over the last month. Currently the club ranks 7th in MLB in both Pitching and Fielding, but their Offense is just 13th ranked. They are one of the most inconsistent offensive teams among all contenders largely due to a debilitating propensity towards the strikeout. At least right now, this has the look of a team that may not even make the playoffs. If they do get in, they could make a quick exit. Atlanta absolutely needs to solve their offensive woes. Statistically the Bosox are not a bad team. They rank 3rd in Pitching and 4th in Fielding in all of MLB. But it is their 20th rated Offense that has been a killer. They've fallen 12 1/2 games out in the A.L. East race, and are even 10 games behind in the Wildcard chase. At the trade deadline, they swapped out free agent-to-be ace starter Jon Lester for A's slugger Yoenis Cespedes, obviously addressing their offensive needs in exchange for some of that excellent pitching. It may be too little-too late for Boston in 2014, however. Statistically, the Rays are not a bad team. This is not a recording (see above.) Tampa dug themselves a massive hole by playing poorly for the first two months of the season. They spent the better part of June and July digging themselves out of that hole. But much like their A.L. East division rivals in Boston, they may have cashed out by dealing veteran ace David Price at the deadline. The Rays are 7 1/2 out in the division, just 5 out in the Wildcard. But the loss of Price might signal a downturn now, at least in the short term. Baseball is setup for one of the tightest multi-team finishes in it's history. The Athletics made the biggest moves to separate themselves at the Trade Deadline. Right now, they have to be considered the top team in the A.L. and in the game, and I would grant the Washington Nationals that same status in the N.L. heading into the Dog Days of August. No doubt that this month will shake out a few of the above teams from contending status. Still too soon to call any of the races, and that is amazing.